Jerusalem is saturated with beautiful views, many of them are of the Old City, but there are also a number in and around the Old City itself. So if you’re touring around the Old City, keep in mind that no trip is complete without visiting these picturesque lookout points. One of the most famous views in the Old City, the rooftop of the Austrian Hospice lets you gaze out to the Western horizon with the Dome of the Rock, Church of the Holy Sepulchre, Judean Desert and, on a clear day, the mountains of Jordan in your sightline. We will start off right at the entrance to the Old City – through the Jaffa Gate. You must already know the Tower of David and the magnificent museum that in nestled away inside of the tower. But what about the panoramic observation deck located in the Petachael Tower – an ancient guard tower next to the Tower of David built by King Herod? This is one of the most spectacular vantage points we have ever seen. From the Pezael Tower, you can see the four quarters of the Old City, the New City, the Mount of Olives, Mount Scopus, the Judean Desert and the Moab Mountains in Jordan. 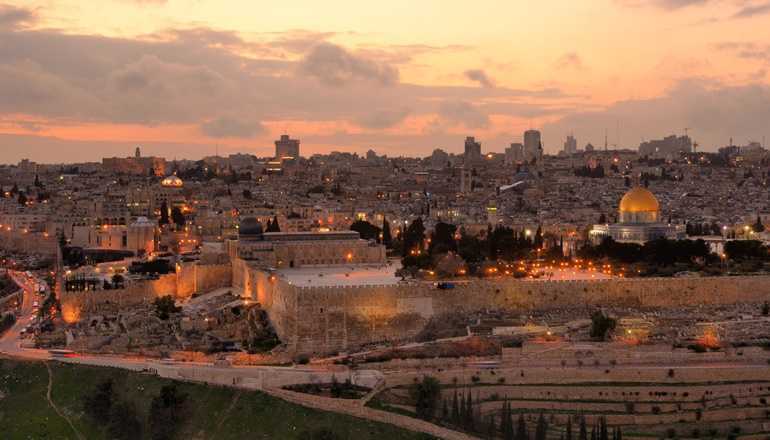 This is a must-see destination for any visitor in Jerusalem, where the entire Old City will be at your feet. Think of the amazing pictures you can take from the tower! Now that deserves a selfie! For a bird’s-eye view of the Western Wall Plaza, walk through the Jewish Quarter and down the steps to Aish Hatorah Yeshiva. It’s one of the best photo ops in the Old City and a favorite hidden corner of local tour guides. Immediately outside the walls at the base of Mount Zion, the terrace of the Room of the Last supper (the roof of David’s Tomb) offers a photo-worthy view of the the Dormition Abbey with the Mount of Olives and Old City walls in the background. It’s one of the most underrated views in the entire city and an extra special sigh around sunset. The Ramparts are the walkway on top of the walls that surround the entire area of the Old City. 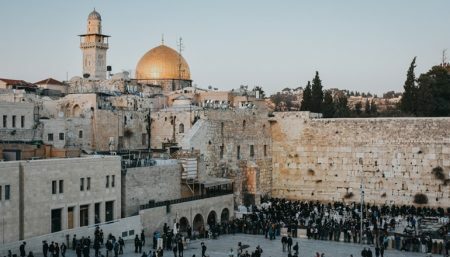 For just 15 NIS entry, you can get a roof-top level view of any part of the Old City and its surroundings from just about any angle you want and pretend you’re watching out for incoming invaders. It’s outside of the Old City walls, but we’re going to call it close enough since it is possibly the most iconic view of old Jerusalem and the starting point to almost any tour. While the Dome of the Rock and the rest of the minarets, domes and steeples of the Old City are at the forefront of the view, one of the elements that makes it so special is the contrast with the skyline of West Jerusalem in the background.